F-35 and the "Crack"-pots of Doom...Again. If the F-35 is 'plagued' by anything, it is plagued by critics who haven't a clue as to how Airframe Durability testing is conducted, what its objectives are, and how it fits into the modern aircraft development process. It seems this ignorance 'dooms' the F-35 program to an annual round of misplaced and sneering derision by people who have no idea they are broadcasting their own ignorance after every DOT&E report release. Durability Testing Promotes the Useful Life. Amusing as it is, such unwarranted criticism is counter-productive. 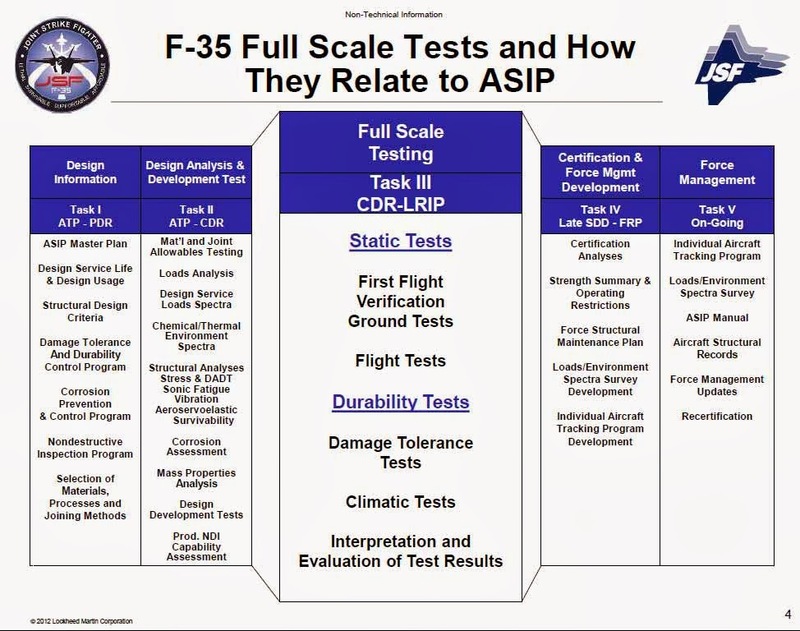 I could produce a lengthy dissertation (you know I can) on the history and benefits of this kind of testing, and show how the developments to-date for the F-35 are no different than the programs before it --except for the F-35 doing it perhaps better and in a bigger fish bowl --but that would bore the cr*p out of most people.On top of that, the unrepentant anti-JSFers would only claim I was making excuses or some other equally stupid assertion. So I will default to providing an illustrative example of what I mean. Consider the following passage concerning the EARLY F-16 development (Queen's English BTW). In parallel with the flight-test programme a series of ground fatigue trials were carried out on the fifth development airframe. A test rig set up in a hangar at Fort Worth used more than 100 hydraulic rams to apply stress to an instrumented airframe, simulating the loads imposed by takeoff, landing and combat manoeuvering at up to 10g. By the summer of 1978, this airframe had clocked up more than 16,000 hours of simulated flight in the rig. These tests were carried out at a careful and deliberate pace which sometimes lagged behind schedule. As the tests progressed, cracks developed in several structural bulkheads. News of this problem resulted in hostile comments in the media, but GD pointed out in its own defence that the cracks had occurred not in flying aircraft but on ground test specimens. If the risk of such cracks during development testing was not a real one, a company spokesman remarked to the author at the time, no-one would be willing to pay for ground structural test rigs. GD redesigned the affected components, thickening the metal, and installed metal plates to reinforce existing units. --Source: F-16: Modern Fighter Aircraft Vol 2., Pg 18. ARCO Publishing, 1983. Sounds kinda' familiar doesn't it? I was tempted to employ some trickery to deceive the reader into thinking the above was written about the F-35, but I think this point is better made straight up. Even after this testing, because the F-16 was initially the ultimate knife-fighting hot rod of a dayfighter, there were useful-life 'issues' on the early airframes. Pilots were flying higher G-loading at several times the rate as previous fighters and higher percentages of the time than that for which the airframe had been designed. A Q&A series on things you probably know but your friends probably don’t. I’ll update the subtitle and bump the post every time I add a question. The number of questions in the end will be determined by where the discussion takes us. I anticipate that my primary sources will be the AF Weapon Systems Evaluation Group, The Ault Report, Marshall Michel’s Clashes (and perhaps some of his other writings), some Air Force Historical Studies Office publications, and Nordeen’s Air Warfare in the Missile Age (Second Edition) at the minimum. I’ll add other sources as required. ﻿﻿I intend to start simply and build on the discussion. Readers are invited to answer the latest question for themselves before they open the fold. Below the fold I’ll post the answer along with perhaps some related observations including the relevance of the question and answer today. If you have questions or comments about a particular question or section, please reference the relevant question/section number(s). Otherwise this 'single post' format may become confusing pretty quickly. NOTE: I've 'inverted' the series to keep this post from taking up so much real estate AND to allow people who've been following the series to get to the new stuff without wading through the old stuff. If you are just joining us, take a stab at the latest question and open the fold to see past questions as well. From the ‘Acquisition Phase’ we now move to consideration of the “Attack Phase”. 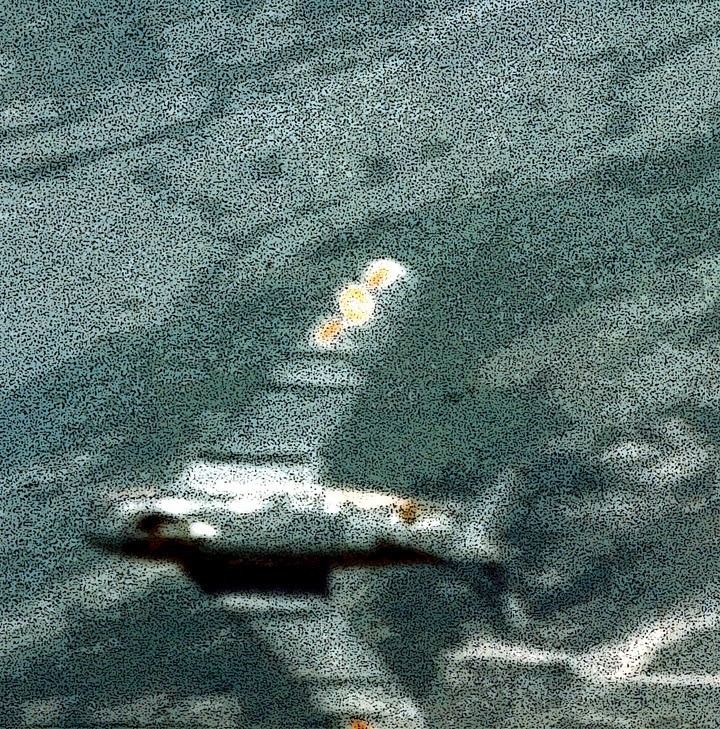 The performance of U.S. aircraft, combined with the skill and tactics employed by U.S. aircrews versus the enemy aircraft/crew combinations, resulted in a 111/8 advantage against the MIG-17 and 36/1 advantage against the MIG-21. This result indicates that under the prevailing conditions, timely position information of the enemy aircraft was the single most significant requirement to enable U.S. aircrews to achieve a position to fire first. However, reference to Figure III-B1 indicates that only 41 of 154 or 27 percent of U.S. first attacks resulted in a MIG kill. Any improvement in U.S. weapons or weapon delivery capability would result in an appreciable number of MIG kills for these acquisition conditions. The Red Baron authors recognized there might be “a slight upward bias to the ratio of U.S. to enemy firing attempts” because “there probably were instances where the enemy achieved a firing position and even fired its weapons without being observed”. But this may be balanced out if one thinks of ‘opportunities’, since it was acknowledged that there were circumstances where opportunities for the U.S to attack were ‘passed up’ when it would have interfered with the primary mission. Example: F-105s at one time were ordered to ignore MiGs unless they were under imminent threat’ (Red Baron, Vol, IV, pg 47) . 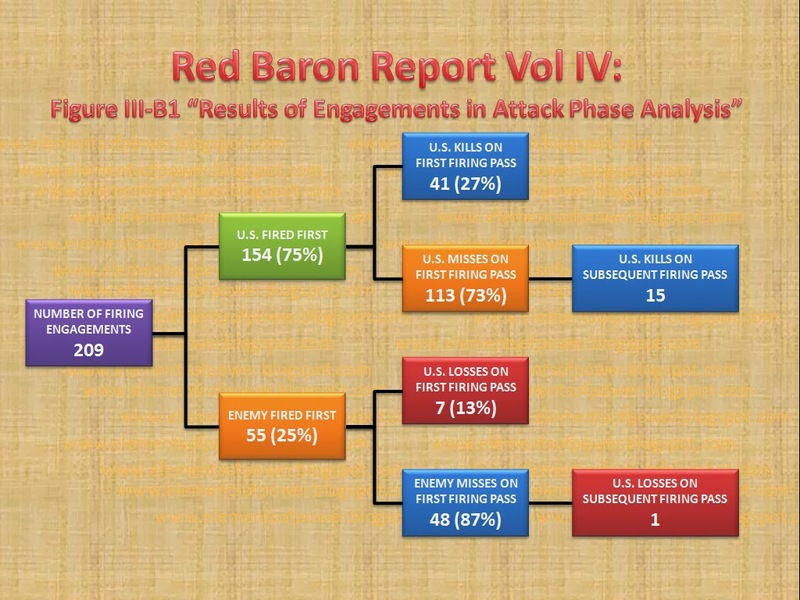 The Red Baron Study looked at the engagements in the previous discussion using a variety of factors in an attempt to evaluate the potential encounter outcome as a product/result of those factors, where there was sufficient information (data) available to analyze. There were other factors the study members would have liked to have included (crossing angles, attitude, sun position, maneuver sequence to name those listed in the report) but there was insufficient data of those types for too many of the engagements to perform a statistical analysis. 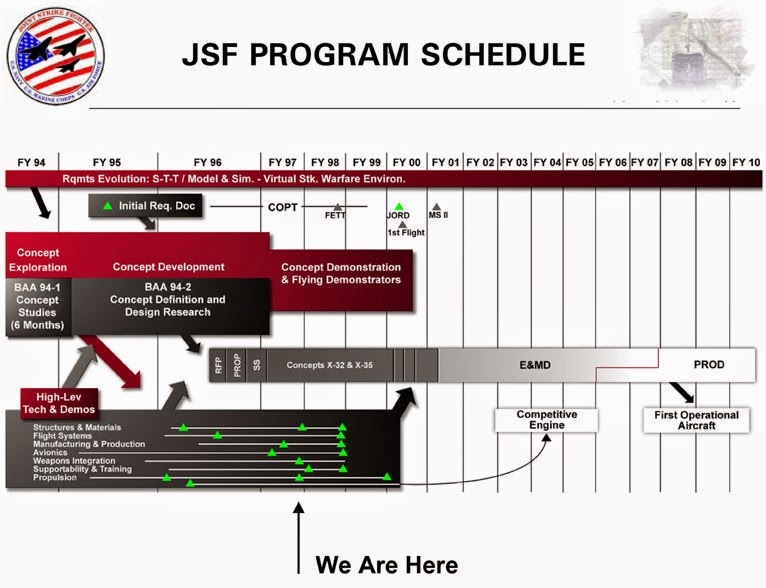 Courtesy of F-16.net yesterday, I got a late head’s up on one of the Anti-JSF (politico, journolista, and ‘reformer’) memes that 60 Minutes is going pick up in their JSF segment tonight: “There’s been too much ‘Concurrency’ on the F-35 program”. How far 60 Minutes will run with the meme I don’t know, but I thought I’d highlight here just how the F-35 is ‘different’ from most (and ALL Air Force) post-WW2 predecessor programs, by highlighting the one aspect where it is viewed differently from all its predecessors. While I’ve compiled prior examinations before on this topic, exposing the Concurrency Canard for what it was, and further reemphasized same when more supporting information became available, I think perhaps a review of the actual historical record should further drive the point home that ‘Concurrency’ as it applies to the F-35 is merely a smokescreen used to distract the ‘ahistorical’ among us. Our results (located at [link fixed by me], based on examining 28 programs across all Services, are very similar to those of the Congressional Budget Office and RAND [example] studies with one surprising exception: While from a purely statistical point of view we found that the relationship between both planned and actual concurrency and cost growth was very weak, in both cases, there seems to be a “sweet spot” of about 30 percent concurrency. That is, programs that plan on spending 30 percent of RDT&E funds while concurrently spending procurement funds actually experience the lowest average cost growth. Similarly, those programs that actually do spend about 30 percent of RDT&E funds while concurrently spending procurement dollars, even when not originally planned, also experience lower cost growth. Furthermore, programs with planned or actual levels of concurrency below 30 percent experienced higher cost growth than those with higher levels of concurrency. In other words, lower levels of planned or actual concurrency were actually worse than higher levels of concurrency. This is the complete opposite of what many in the acquisition community believe. We speculate that lower levels of concurrency may expose the program to higher levels of external changes. Some of these GR&As will apply to this post, but most will be saved for perhaps later discussions. It just so ‘happens’that I’ve been looking at the Post-WW2 aircraft program data and histories for quite some time and have been using what I’ve found to develop a database of production quantities, service lives, and variant definitions for various analyses. There is always variability in data definitions and data quality when comparing separate systems and programs over long time spans. There are also often gaps in information. For this exercise I chose to use only programs where the aircraft were actually fielded. Where there were gaps in the data, I tried to select the most conservative approach to estimate. For example, if a production contract was signed in either 1951 or 1950. I would select 1951 for cost purposes. For another example, if it wasn’t clear if a variant was fielded in 1963 or 1964, I would select the earlier year for service life estimates.) Since how well a fighter performs or how long a fighter remains effective is not directly related to how long before it is completely phased out, I chose to use the point in time a fighter begins to be withdrawn from ‘front line service’ as the standard for calculating ‘front line service life’. For early jets, this typically involved first transfers to ANG or AF Reserve units, with the exception of Interceptors, for which the ‘front line’ mission was transferred with the aircraft to the Guard and Reserve. Aircraft ‘variants’ are defined as having a model designation change for older jets, but the distinction is blurred with the introduction of later ‘Block’ type designators. The intent will be to ignore subsequent block upgrades and mods (thought they are the norm since early WW2), unless they involve a model (A,B,C,D etc.) designation change. This approach is selected because ALL aircraft receive upgrades over their service lives, but model changes tend to flag major capability improvements with major changes to aircraft configurations. We won’t be dwelling on costs or service lives in this post but will focus on typical aircraft evolutions, from the perspective of time and numbers fielded, beginning the ‘first of type’ production units through when the first ‘definitive’ units were procured. We’ll cover the period from 1944 to 1973 in two sections, the first one “Buy Now – Fly Later” we’ll list the Air Force aircraft in the first decade after WW2 for which major production decisions were made before the aircraft even flew. In the second section, “Baby Steps”, we will highlight how many early versions of the jets were built and often discarded instead of upgraded before the definitive versions were decided upon. This will highlight how though configurations were frozen before early variants were contracted for, they were only building blocks to get what was really needed. [20 December] Although the prototypes were still under construction, a production order was released. Unit cost of the first 33 P-86s [ later redesignated F-86] authorized for procurement was set at $438,999.00—more than twice the aircraft's eventual price. The F-101 and F-102 which employed the Cook-Craigie approach (no prototypes) in the pursuit of trying to mature technology before committing to LARGE production quantities, while still committing to volume production as soon as possible. Subsequent jets of the original type were purchased in volume, in evolved forms as a result of lessons learned in operation and test. Some adjudication and ‘calls’ in the analysis had to be made, because the real world isn't tidy. For example, I elected to use the F-104G as the definitive model type, though the US never bought it, it was the most numerous and built upon all the prior developments. I didn’t include a lot of F-86 variants prior to the D model because they were really parallel efforts. The F-84F was different enough from the previous versions that if it had been designated during the F-106 era, it would have certainly been given a different number designation, but it was still the final evolution of a long line of F-84s. There were quite a few other types of aircraft, but not bought in 'major' quantities (except for perhaps the F-86H and precursors but I didn't want to over emphasize the F-86). The most important thing to take from this chart is NOT that in the past, we built aircraft as best we could, learned from them, and made them better in the next iteration. The takeaway IS that we fielded needed technology as fast as possible knowing we’d learn something new, or possibly fall short (without fear), or learn we needed different or just ‘better’ technology. We then incorporated those lessons learned to get the systems we needed. Most of the time those precursor aircraft had limited front-line service lives and were seconded or scrapped less than a decade after they were built. Compare that approach with today’s approach; the one used for the F-35. A limited number of aircraft have been produced, with the intention of making them all (or nearly all) meet the baseline standard (Block 3) through subsequent modification. 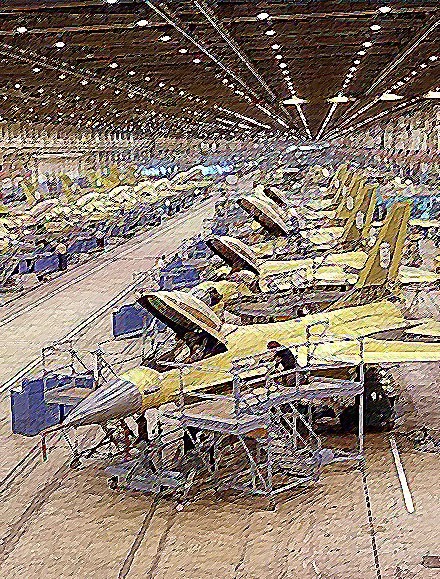 There will probably be around 200 aircraft (or fewer) produced before the first Block 3 plane is rolled out, far less than 10% of the currently planned total production run, and all but the most early of those jets will be upgraded to baseline standard via mostly software/component updates. Even if the production ramp up hadn’t been delayed by playing the faux ‘concurrency’ card, there still would have been far fewer F-35s needing upgrade than obsolete precursor aircraft produced in fielding previous ‘major’ types. Stretching the program added more costs and more total risks, just fewer technical ones. I can't emphasize enough that how we frame the concurrency question defines the concept and discussion in the public square. We must recognize that the detractors are playing games with the definition of concurrency to make the F-35 seem worse than it is and worse than predecessor aircraft programs. This is easily demonstrated by looking at the F-16's evolution. I’ve noted multiple times around the web, with no credible rebuttal to date I might add, that there were 291 F-16 Block 1 and 5 deliveries before the first 'nominally' useful Block 10 was built. To keep perspective, the YF-16's first flight (official) was Feb 74, and the first definitive and fully capable Block 30/32 F-16s for the US first flew Feb 87. Counting all partner nation deliveries, approximately 1800 F-16s were delivered before the fully capable Block 30/32s. Until the Block 30/32, all the capabilities of the F-16 were less than what was envisioned by the planners (just not the so-called 'Reformers'). The Block 30/32s were the first F-16s with full Beyond Visual Range-engagement and night/precision ground/maritime attack capabilities. They were the first with full AIM-7/AMRAAM/AGM-65D/HARM capabilities. They were also the first with Seek Talk secure voice communications. Until Block 30/32, the F-16 was mostly a hot rod for knife fighting on blue-sky days. At Block 30/32 and beyond, it was what the users wanted in the first place. An ‘all-weather combat aircraft’ to the users, or what the so-called ‘reformers’ refer to as ‘ruined’. Fielding 1800 F-16s aircraft before you reach a 'baseline' in Block 30/32? Thirteen years after first flight? I’ve said it before and I’ll say it again: THAT is 'concurrent development'. To varying degrees, the same phenomenon can be shown for the F-15, and the F-18's, just look a the program history and the rationales behind the differences in variants. P.S. Sorry I couldn't get this post up before it aired in most places. 'Life' intervened. Many thanks to 'DaveO' and 'LtColP' at Op-For for the opportunity to give a guest commentary today, to explain and expand upon a comment I made in an earlier thread on Op-For . This is particularly 'timely' considering there's a 60 minutes segment on the F-35 tonight. I myself am prepping a quick viewer's guide as it concerns the topic of 'Concurrency'. Should be up before it airs in most time zones. Mmmmm. BACON! I usually like to fry mine so it is somewhat less crispy, but tonight? ‘Carbonized’ is just fine. Don Bacon & DeBriganti. What could go wrong? Defense Aerospace has a ‘guest commenter’ who appears to have more ambition than to just keep saying stupid things in the comment threads at other people’s websites. He now wants to be ‘featured’ saying stupid things. You don’t have to go there to read it. I fisk it here, so you don’t have to take a shower afterwards. The F-35 selected acquisition report (SAR) reported last Spring that there had been no progress in reducing its staggering $1 trillion, 50-year life-cycle cost. Then in June 2013 it was reported that "the company and the U.S. military are taking aim at a more vexing problem: the cost of flying and maintaining the new warplane." Not only was the total cost stratospheric but the cost per flying hour was much higher than the legacy fleet at $31,922. 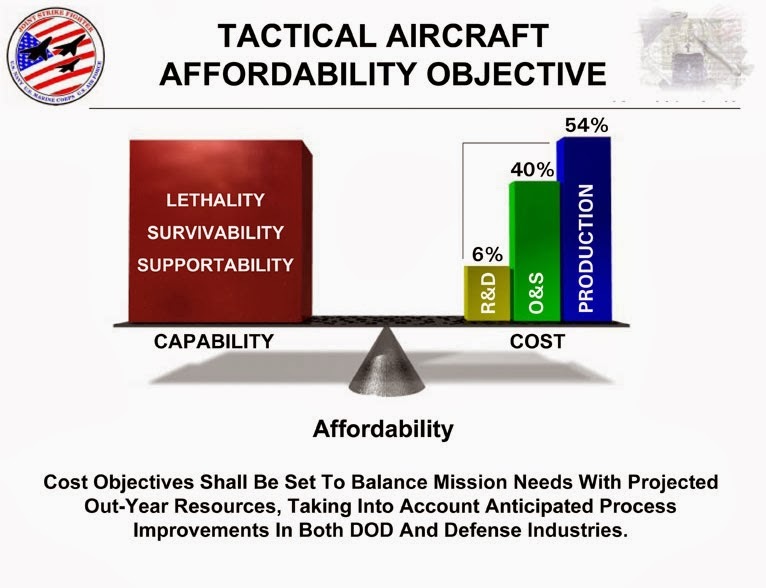 What could be done to cut high operations and sustainment (O&S) costs? International customers were being scared away by high production costs, and particularly by high operating cost. WASHINGTON (Reuters), Aug 21, 2013 - "The U.S. government has slashed its estimate for the long-term operating costs of Lockheed Martin Corp F-35 fighter jets by more than 20 percent to under $1 trillion, according to a senior defense official, a move that could boost international support for the program." That arbitrary announcement out of the F-35 program office that operating cost had dropped from $1.1 trillion to $857 million didn't fly very high. (See related story—Ed). On September 6 the Pentagon acquisition chief Frank Kendall announced that there would be a review of F-35 operating costs. Kendall indicated that the program office's estimate might have been overly optimistic. In fact the GAO has reported that F-35 operating and support costs (O&S) are currently projected to be 60 percent higher than those of the existing aircraft it will replace. “We’re … looking at that number,” Kendall said. 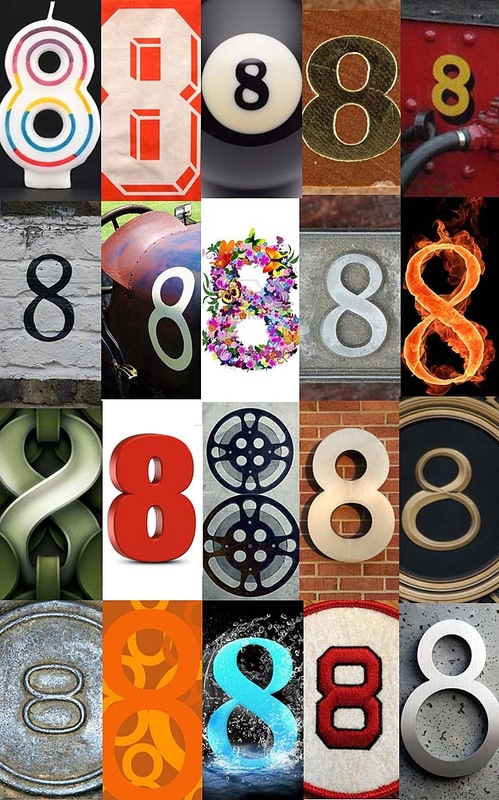 “The official number is still the one we put up in the SAR [selected acquisition report]. We’re going to do a review of F-35 this fall. We’ll get another estimate out of CAPE [Cost Assessment and Program Evaluation] for that and we’ll probably make some adjustments. On October 6, 2013 Kyra Hawn, spokeswoman for the Pentagon’s F-35 program office, said a high-level Defense Acquisition Board meeting was expected to proceed on Monday despite the partial government shutdown. The meeting has already been postponed several times. Well that CAPE meeting came and went, with no news on F-35 operating cost. The cost data must have been bad and so it had to be covered up, just like other cost data (production cost, etc.) on the F-35. We did get some PR fluff out of the meeting, though. “While risks remain, progress on the F-35 program at this point has been adequate to support a decision to budget for increased rates,” Frank Kendall, under-secretary for acquisition, said in a decision memo. If it was good cost news supporting an increase in production rates, then why didn't Kendall release the data? Apparently the opposite was true, the data was bad. 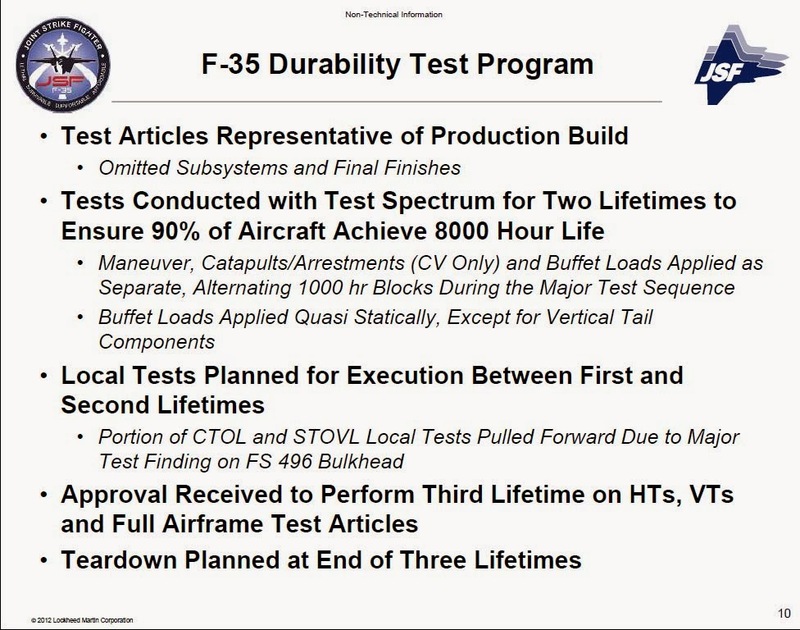 And now we have the data, in the FY2013 F-35 test report, and it isn't pretty. Bacon cherry picks old news reports and not only ponders why there’s been no operating cost updates, but asserts it must be bad for the JSF because Kendall would have released it if it were ‘good’. I could just say “proof please”, but I got a theory too—only I’ll tell you it is just a theory and not assert it as ‘fact’. As we have noted all along (one, two, three) the actual costs have consistently come close enough to LM’s ‘should cost’ curves to call LMs estimates 'accurate'. The CAPE stuff? Not so much. My theory assumes the CAPE-ers will try to cover their collective estimating a**es by bringing down their estimates slow enough that (they hope) people won’t notice how bad they were to start with. Note I do not blame the analysts themselves, just their political management that tells them what and how to compute. As to the ‘massive’ O&S costs (Cue Austin Powers clip) ONE TRILLION DOLLARS!? Who the H*LL cares about a GUESS covering FIFTY years of future operations? Answer: No one. At least no one in their right mind that is. Pssst, Don: Calculate the B-52s operating costs over the first 50 years, go back in time to the start of the program and tell them what it will cost in 2010 dollars. Think that would stop them? Answer: No. They, unlike you and the legions of mouth-breathers, actually understood the 'time value' of money. Next, Don Bacon takes us into a world where he proves he hasn’t a freaking clue: R&M. Similarly with the F-35B -- fly it for 3 hours, critical failure, then corrective maintenance takes 15.5 hours (7.5 hours more than last year). As I noted over at F-16.net, “Statistical Crimes Against Humanity” were about the only thing of note in the latest DOT&E report. Bacon evidently even missed the part of the DOT&E Report that stated: “the program has fielded too few F-35C aircraft to assess reliability trends”. That’s OK though, because the entire program has flown too few hours, especially considering training activity and the changing and expanding operational footprint, to assess anything meaningful. The fact that reality didn’t stop some calculator in DOT&E from applying their inconsequential knowledge simply invites more abuse of math and logic. I’m surprised Bacon didn’t also glom on to that B.S. software reset ‘analysis’ inside. Maybe that much idiocy was obvious even to Bacon. I started the growth slope at zero, but that isn’t really important, as the initial starting point is usually an educated guess or completely capricious. Raise the start point to 5-10 Hrs MTBCF if you like: it is still a long way from where the ‘grade’ counts, and not much of a slope to climb from where the program is now. These charts are simplified and use a linear scale, so remember Log-log scales as are the norm, as I've thoroughly described before (same link as previous). Also note the apparent bobbling in the ‘objective’ lines comes from rounding and my selecting precise flight hour data points for the current flight hours in the DOT&E report among the other, evenly spaced, ones. 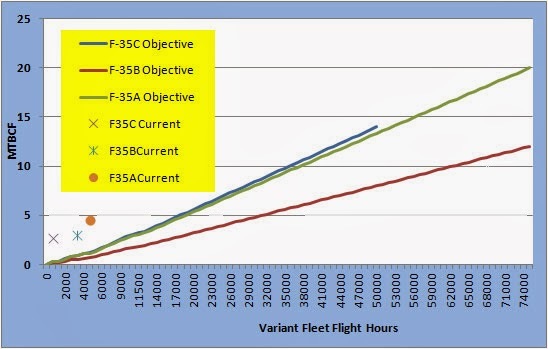 Give us a ring when the planes get to about the 25K-30K Flight Hour per variant and 100K Fleet Flight Hour mark. Then we can talk trends and problems areas. Same thing goes for the mean-time-to-repair (MTTR) figures. And bring average crew size and MMH/FH with you so it can be discussed intelligently next time. So Bacon then decides he wants to beat on fictional operating costs some more. Let’s keep tagging along shall we? If anybody thinks the acquisition cost is high, and it is, it will be totally eclipsed by the operating cost. An independent audit by KPMG has estimated the cost of buying and operating the F-35 warplanes at $600-million per jet, two-thirds of that operating cost. Ahem, Minor point. It is a rule of thumb that 2/3 of total life cycle costs are in the operating and support of the systems. Nothing shocking there. It is an accepted premise and I think it was taught in just about every DAU course I ever completed. Any bets Bacon wants to use it for nefarious purposes? All of this reality runs against what the early F-35 promises were. 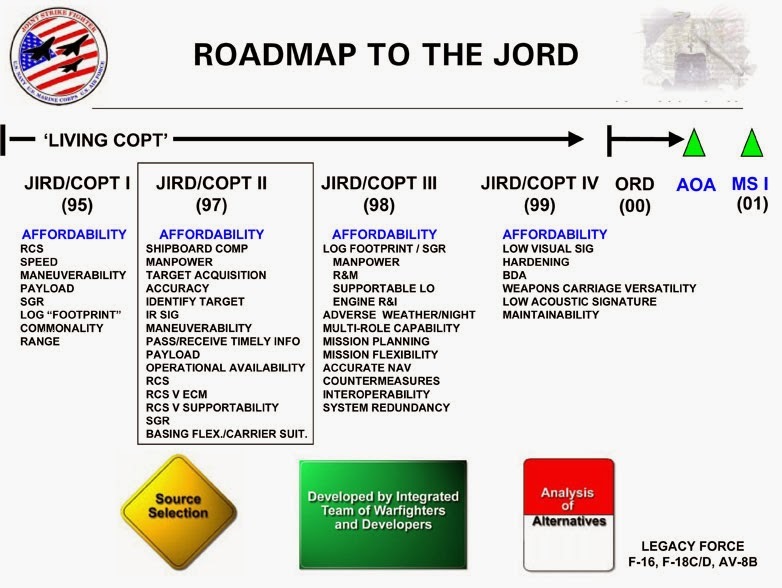 -- From the 1997 doc -- "The Affordable Solution - JSF": Tactical Aircraft Affordability Objective 1997: R&D 6%, Production 54%, total dev & prod 60%, O&S 40%. So the F-35 has gone from an initial-operating cost ratio of 60-40 to 26-74, and that's with much higher production costs. Nobody can afford that, especially foreign customers -- which is why it's been covered up. Are you doing it 'intentionally' or 'stupidly'? See anything in there about those numbers standing for the proportion of total cost? Me neither. Next slide? Wow. The two X-planes aren't even built yet, and the requirements document isn't even firmed up to determine how much capability for what cost will be pursued. More talking about affordability opportunities to balance before deciding what to pursue. the whole briefing is this way. I’d love to find the original with ‘notes pages’ view for clarification just to smack the stupidity down even more for my visitors, but I guess I will have to (for now) settle for just salting the wound by pointing out the 1997 ‘document’ wasn’t an authoritative source to begin with. With only a cursory search, I’ve found three copies on the web of various versions and unknown provenance, none on an official government website. So Bacon bases his argument on a 17-year old PowerPoint slide with a unexplained message and calls it a 'conspiracy'? Can’t you just feel the Dezinformatsia in Bacon’s ramblings now oozing out into the interwebs and being passed around by the illiterate and the innumerate? So who is this 'Don Bacon' writing this drivel for the Euro-Shill? Don Bacon is a retired army officer with acquisition experience, who has seen how programs go wrong in spite of the evidence, largely because of the military 'can-do' attitude which leads to harmful, ineffective results. Now he is a private citizen who sees the necessity of challenging baseless claims in order to get to the truth, and so the truth will prevail. That’s rather verbose for “completely clueless out-of-the-loop retiree with no knowledge relevant to the subject which he so ardently, yet so flaccidly opines about” Isn’t it? No wonder the children don’t respect their elders anymore.